Treb's Blog Stop: POOR BUCK!!! Buck has been confined to the kitchen while we are at work, as long as our baby gates hold up. The kitchen is covered with linoleum from the 70's. Vinyl covered that doesn't absorb anything that isn't on there for days. THAT is essential for a new puppy. Poor Buck, he does not like being in the confines of the kitchen... 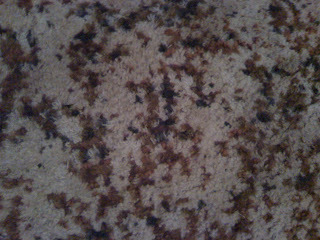 However, if you look at the 1970's pattern on our carpet, you will notice that it is design of a variety of brown splotches on tan. I call that pattern, puppy poo camouflage. Not something you want in your house in the early days of house breaking. It requires a sharp eye, and light stepping. At least soldiers have a mine detector... they don't make things like that for puppy owners. Puppies, LIKE BUCK, like to leave little IED's (improvised excreted device) in places where you least expect it. We are very vigilant and keep a sharp eye on him when he roams the house. When the signs pop up we distract him long enough to get him out side, but he is a little sneak sometimes. I'll be glad when we can trust him like we do Red. You trust Red? Hahaha - Now lets talk about Maggie and trust! That dog potties on comand! 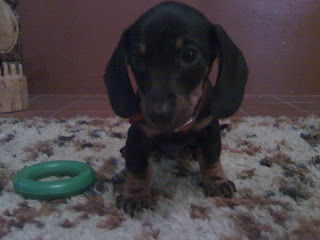 I can't wait to meet Buck - bring him to visit! Is there an IED in that picture??? No Dayna, that is our carpet. I love the style of the 70s, when you can't tell whether or not the carpet has been disgraced by a puppy.